Chapman University’s Rodgers Center for Holocaust Education is honored to have the LA Museum of the Holocaust host a special exhibit featuring 20 years of prize-winning entries from Chapman’s annual Holocaust Art and Writing Contest. Holocaust survivor Natan Gipsman, admires the art inspired by his story. The artwork, “Humanity” was created by Kristen Landsman and was first-place in the high school division in 2018. "The student works testify eloquently to the power of Holocaust memory to educate, engage and empower and to the extraordinary ability of students to grasp the essence of memory and respond creatively,” said Marilyn Harran, director of Chapman University’s Rodgers Center for Holocaust Education. Chapman University’s Rodgers Center for Holocaust Education https://www.chapman.edu/research/institutes-and-centers/holocaust-education/rodgers-center/index.aspx is honored to have the LA Museum of the Holocaust http://www.lamoth.org/ host a special exhibit featuring 20 years of prize-winning entries from Chapman’s annual Holocaust Art and Writing Contest https://www.chapman.edu/research/institutes-and-centers/holocaust-education/rodgers-center/holocaust-art-and-writing-contest/index.aspx. The exhibit titled “Messengers of Memory” includes first place entries in prose, poetry, art, and film representing the more than 100,000 middle and high school students who have participated in the contest. Initially regional in its outreach, this year the contest includes students representing 27 states and 12 countries, including Europe, South America, Africa, and Asia. “In a time of rising antisemitism and xenophobia, with ever fewer Holocaust survivors to witness in person to students, we are challenged to find new ways to engage students in learning about the Holocaust so that it becomes personally meaningful and goes beyond statistics and brief paragraphs in textbooks. These student works testify eloquently to the power of Holocaust memory to educate, engage and empower and to the extraordinary ability of students to grasp the essence of memory and respond creatively,” said Marilyn Harran, director of Chapman University’s Rodgers Center for Holocaust Education. Since 1999 and in partnership with The 1939 Society https://www.the1939society.org/, a Holocaust survivors’ and descendants’ organization, the art contest challenges young people to engage in a direct and personal way with Holocaust survivor testimony to create unique and meaningful art from the memories. Chapman University https://www.chapman.edu/ is California’s third largest private university and ranks fifth in the U.S. News & World Report listing of Best Regional Universities in the West. Chapman is categorized by the Carnegie Classification as an R2 “high research activity” institution and offers personalized education to more than 8,000 undergraduate and graduate students. Chapman strives for diversity and inclusion by recruiting and supporting students representing a variety of backgrounds, experiences, learning styles and unique talents. The campus has produced a Rhodes Scholar, been named a top producer of Fulbright Scholars and hosts a chapter of Phi Beta Kappa, the nation’s oldest and most prestigious honor society. Founded in 1861 and based in the City of Orange, California, Chapman also includes the Harry and Diane Rinker Health Science Campus, 21 miles south in the Irvine Spectrum, Orange County’s technology hub. In 2020, the university will open its 11th college, the Fowler School of Engineering in its newest facility, Keck Center for Science and Engineering. Los Angeles Museum of the Holocaust, the first survivor-founded Holocaust museum in the nation, commemorates those who perished, honors those who survived, and houses the precious artifacts that miraculously weathered the Holocaust. Since 1961, the Museum has provided free Holocaust education, fulfilling its mission of to educate, commemorate, and inspire. Through programs that value dialogue, learning, and reflection, the Museum believes that we can build a more respectful, dignified, and humane world. 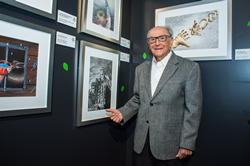 Photo Caption: Holocaust survivor Natan Gipsman, pictured here, admires the “Messengers of Memory” art inspired by his story. The artwork, “Humanity” was created by Kristen Landsman and was first-place in the high school division in 2018. Kristen’s artwork was inspired by Mr. Gipsman’s video testimony https://www.youtube.com/watch?v=HpxdKpdU8G4.